Buying a car in a car dealership can be more than a bit nerve-racking. They have the cars – and they also have the knowledge. If you’re like most people, you don’t have either. That puts the car dealership in a stronger position than you. 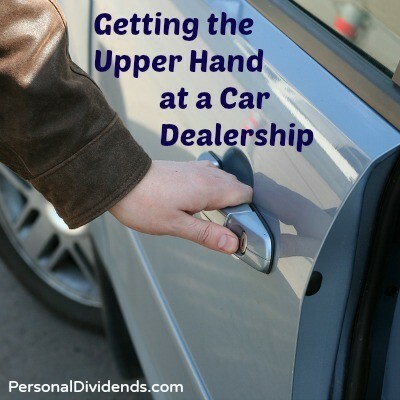 There are ways of getting the upper hand on the car dealership – if you know what to do. One of the best ways to gain the upper hand in a car dealership is by knowing the true value of the car that you’re looking to buy. You can do this by researching the car’s value online. There are excellent websites, such as Edmunds.com that make is easy to do, even for a car novice. Whether you are looking to buy a brand-new car, or used one, a site like Edmunds can provide the true value. All you need to do is input as much information on the car as possible, and you will get the price on the car in your geographic location (car values do vary somewhat from one region of the country to another). Once you have the value from the site, print it out and bring it with you to the car dealership. You don’t need to mention that you’ve done your homework right away, but having a printout just in case it becomes necessary is always a good idea. Armed with the true value of the car, you’ll be in a much better position to negotiate a fair price. Whenever your buy a new car, it’s always best to try to sell your current car before working with the dealership. While a dealership will make the trade-in on your old car very easy, they won’t give you what the car is really worth. By selling the car yourself, you’ll have a much better chance of getting its true value. You can try and sell your car through websites such as Craigslist, or even your local newspapers online classifieds section for autos. By selling your car yourself, you will not need to rely on the dealer to buy your car from you. Selling your car before you go into a dealership can strengthen your position on so many fronts. Given it a try before going the trade-in route. Dealer’s love to provide financing for your new car – after all, they make money on that too. But getting your financing from the dealer is giving the dealer too much power. By having your own financing lined up in advance – such as from your own bank or credit union – you once again demonstrate that you are a strong buyer, who is prepared to make a deal. The bonus of this strategy is that the dealership will try hard to beat whatever financing deal that you get from your own lender. This will guarantee you’ll get the very best financing that the dealer has available – and without having to fight too hard to get it. If after doing all of that, you still don’t feel that you can hold your own in a car dealership, you still have an option – bring your own car expert with you. In fact, this is an excellent strategy if you don’t know a lot about cars. Car dealers will often try to impress you with their car knowledge, and it often works wonders. You don’t have to be a car expert yourself, but if you know someone who is, you can bring them along and take the advantage away from the dealer as well. By knowing the value of the car you want to buy, selling your own car to have a cash down payment, having your own financing, and bringing your own car expert to “talk shop” with the dealer, you will have essentially removed all of the dealers advantages. This will clear the way for you to get the best deal on a car possible.